Last edited by blackpopracing; 21-10-2012 at 20:32. That looks like its going to be one mean mother. I like very much looking forward to seeing this when its done. So you done anymore recently Mark? Been folowing your build up site and love what your doing. Keep it up, the end is sooooo close! Zetec powered pop on its way! Yep, painting cage at the moment, second coat of gloss went on last night, rubbed it down again tonight, third coat tomorrow. I'll start with a few of the very old shots of when I first started, and add to them later to bring you all up to date. cutting roof off for a chop. 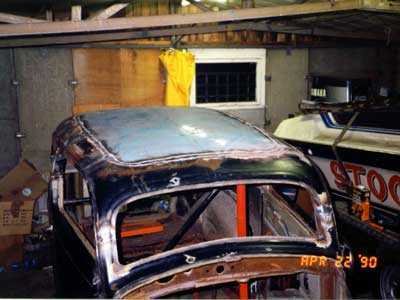 Roof back on again, with a Cortina MkIII insert welded in. 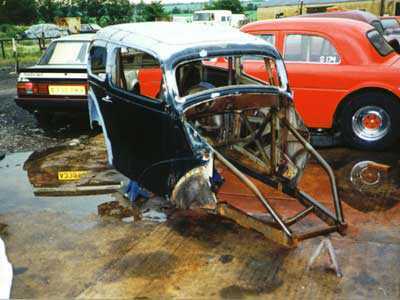 Getting chassis & cage built. Last edited by blackpopracing; 24-04-2009 at 16:20. 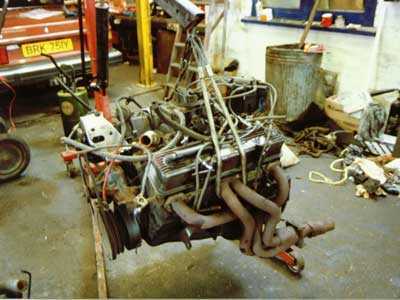 Engine and radiator fitted, with front suspension fitted ~ which got sold off later, lol!! Mocked up with the glass panels at the end of 1990. 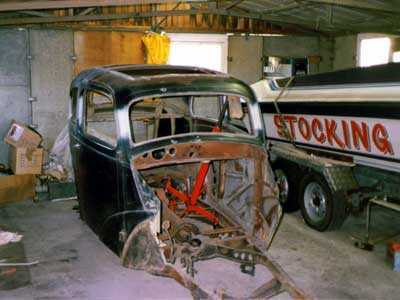 I then bought a house and had to build a garage for it to go in, so not a lot happened till late 92, whe it finally got put in its new home. Ford 9" axle fitted on 4 bars with diagonal link, Scorpio discs and calipers adapted to fit. Which fits in the boot here, you can see the new sheet metal going in for the rear of the boot floor too. Unfortunately I lost a lot of photos (only tiny thumbnail ones left) of the rear panels being replaced, but it was all done and hidden hinges fitted to the rear panel with a fibreglass bootlid. 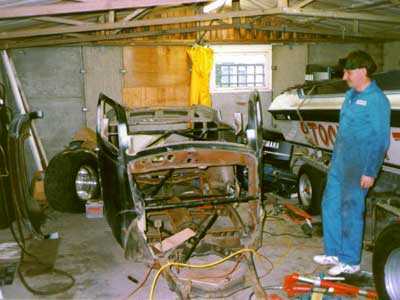 Roll on to around year 2002, and I decided to venture back into the garage again to see what was under the big pile of dust, much to the girlfriends dismay needless to say, not too much got done as a result, but some bits progressed. And this shows how the heater hoses go up to the dash and foot outlets. This was a horrible job to do. Last edited by blackpopracing; 24-04-2009 at 21:01.